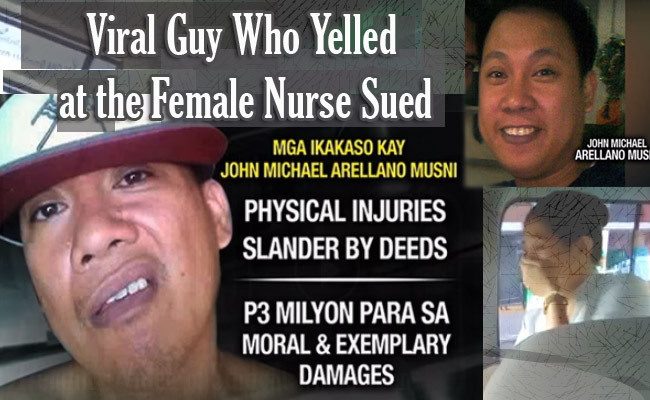 When a video was posted by a concerned netizen where a guy name John Michael Arellano Musni hit, yelled and used foul words to the female nurse name Joan Balen, it became a hot topic to various social media sites. On the original post by Soy Gonzalez last May 3, she uploaded 3 kinds of videos where Musni humiliated Balen inside the fx car. As of this typing, it now reached more than 5 million views and was shared more than 229,000 times. Many netizens got irritated to Musni’s attitude and they bombarded his social media accounts with hateful comments. Joan was interviewed by TV Patrol and she told the media how she was hurt and traumatized on what happened to her. She said that Musni is a sized man and has glaring eyes so she is still threatened to him on what if she will see him on the streets. She also stated her story on how Musni told her to move aside and how he was always indirect hinting her. Joan also showed her arm where Musni smacked her. Joan’s mother was beside throughout her interview and she was very furious to Musni. Meanwhile the policemen went to Musni’s unit at North Olympus Subdivision but he was nowhere to be found. The owner of his unit confirmed that it was Musni who was at the viral video. The homeowners association and his neighbors were alarmed and they suggested the owner of his unit for him to be ousted. Joan already filed a case against Musni with physical injury, unjust vexation, slander by deeds and oral defamation. He also need to pay Joan an amount of Php3 million for moral and exemplary damages. Joan also thanked the netizen who uploaded the video cause it will be an evidence against Musni. Atty. Raymund Fortun offered free service to Joan to help her win the case against Musni.